Picture this, you’re away from home and want to to do a little work. Something simple like forgetting to transfer the files to your laptop can entirely ruin your experience, plus you have to go through all the extra security checks when you take a laptop on a flight. If only there was an alternative. There is! 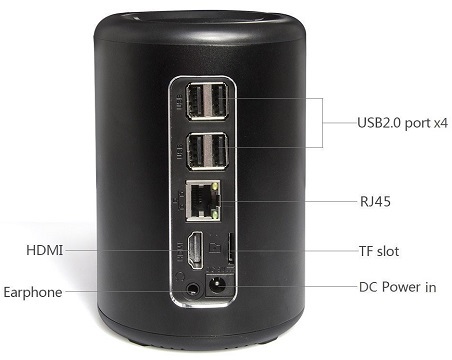 Mini PC sticks cram an entire operating system onto something just a little larger than a USB thumb drive. We’ve searched the market and made a list of the best mini PC sticks available today to help you find the one that best fits your needs. Before we jump right into our product reviews, let’s take a second to talk about mini PC sticks and how exactly they work. This not only allows you to find one that works for you but also stops you from paying hundreds of dollars for something that isn’t worth it. 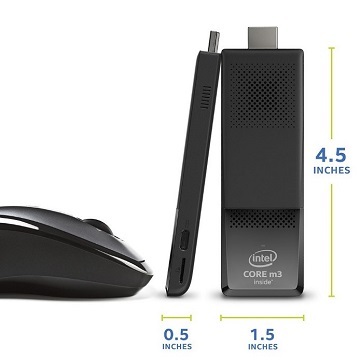 On the surface of it, mini PC sticks are infinitely easier to compare than traditional desktop PCs. 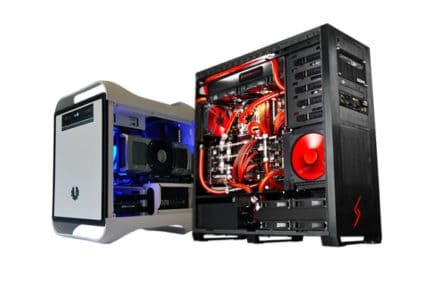 This is because of their small size – there’s no graphics card, which is where people usually get confused. Simply, there are three specs you can compare in these micro-systems. First is the operating system. This will usually be Windows (likely Windows 10) or Linux (most probably Ubuntu). Neither is inherently better than the other but Linux is far more lightweight and as such should run more smoothly on low-powered devices. Ultimately, this part is down to personal preference. Next, we have the amount of RAM available. A computer with too little RAM will stutter, hang, or freeze during data-intensive processes, so this is an area where you really don’t want to skimp. 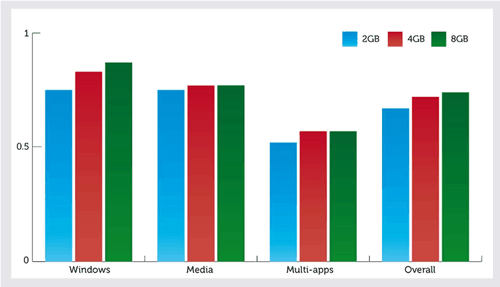 2GB is fine for most purposes, but if you can afford a model with 4GB, even better. So what’s the final thing to look out for? The processor. Now, this is the component that has the largest impact on your PC stick’s usability. You probably won’t find any mini PC with an incredible processor, but you should make sure you get one with at least 1GHz clock speed. Mini PC sticks are fairly straightforward. 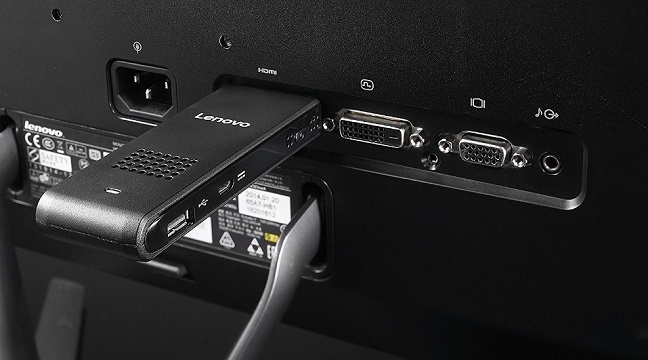 They plug into the HDMI port of your TV or computer monitor and allow you to boot to the installed operating system in the same way a regular PC would. You should be aware that you’re not going to be gaming on these, though. Instead, they’re better suited to light tasks like word processing or browsing the internet. For the most part, PC sticks have very few USB ports. Instead, you might have to rely on tools like the on-screen keyboard or Bluetooth peripherals. This doesn’t mean you have to lug a wireless keyboard around with you, though, since there are apps that allow you to use your cell phone in this way. Let’s begin by taking a look at the PC sticks at the lower end of the pricing spectrum. 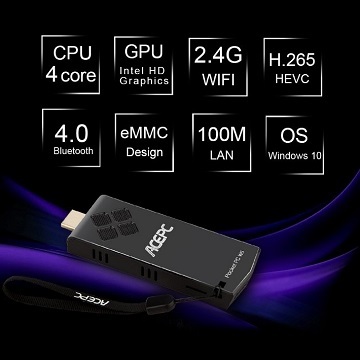 The following products allow you to see what mini PC sticks have to offer without a significant initial investment. That’s not to say that they’re bad, though – in fact, we’re sure you’ll be pleased with how well they work. We’ll start with the Intel STCK1A8LFC. This model is incredibly affordable at around $40 and has a few features not commonly seen, even in more expensive sticks. Plus, since it’s made by Intel, you know that you’re in good hands. After all, they’re one of the biggest computer manufacturers in the world. First of all, this is the only stick in our list that runs Linux. It comes with Ubuntu 14.04 preinstalled and even has two USB port on the side. Now, Linux does take some getting used to, but it allows this product to get the highest possible performance from its fairly basic hardware. Good, right? There’s a quad-core 1.3GHz processor inside. 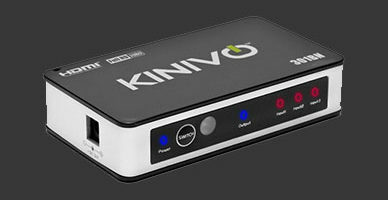 This is powerful enough to handle most basic tasks without any problems and you can even stream HD video if you’d like. That said, it will stutter heavily with 4K footage, so if that’s what you want to watch, you might be better off with a more expensive model. This model is perfect for a wide range of people. Writers will find that it runs word processing programs flawlessly, but it also has wide applications as a portable media center. Put it this way: as long as you remember to bring a standard 5V cell phone charger, you can use this anywhere, anytime. For less than $40, what more could you want? 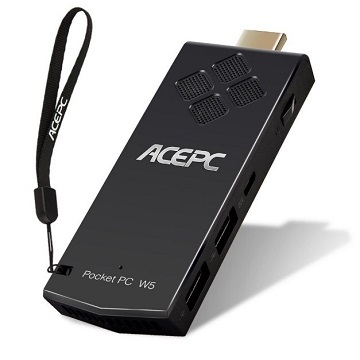 Next up, we have the NEXBOX ACEPC stick. This model costs a little under $100 and offers significant improvements over the last product we saw. Admittedly, it costs a lot more, but stay with us and we’ll describe all the additional features and hardware that help justify this price increase. First of all, this stick includes a basic integrated graphics card. Now, you’re not going to be playing the latest games, but this does allow you to play most web-based games without any issues. Bluetooth and WiFi capabilities are included, and there’s even an HDMI extender to help you reach those awkwardly placed ports. More importantly, the ACEPC has Windows 10 Home installed, meaning anyone can use it easily. There’s 32GB of internal storage, but you can add up to another 128GB using an SD card if you find yourself running out of space. So far, so good, but there’s one last feature we think you’ll really like. The processor offers clock speeds of almost 2GHz. This means that it’ll run better than most recent cell phones. The main draw here is that this stick is actually less expensive while providing greater functionality and a versatility that is as yet unmatched by any cell phone. 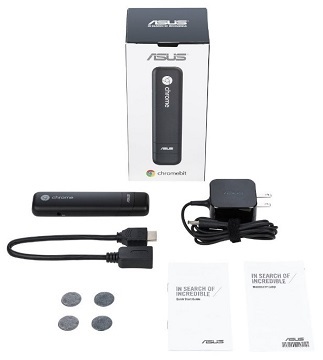 The last of our budget picks is the ASUS Chromebit CS10. It’s available in black or pink and costs around $100. This model uses the Chrome OS – an operating system that uses cloud-based apps to maximize the performance of low-powered hardware. So what else does this stick have going for it? Well, abundant storage, for one. It comes with 16GB of internal storage space but you also get 100GB of cloud space to use. This removes the need for an SD card slot and also allows you to watch your favorite movies no matter where you are as long as you remember to upload them first. Now, there is just a single USB port. However, the CS10 can be paired with Bluetooth devices, so you’ll probably want to invest in a mini keyboard. There’s 2GB of RAM available. This is more than enough because the web versions of most office software programs are already optimized for use on this type of device. This product is best suited to someone forgetful. With cloud storage, there’s no need to transfer files between different USB sticks or SD cards – just upload it, and it’s instantly available from anywhere in the world. Around $100 for an easier, stress-free file management system? Sounds good to us. If you’re willing to spend a little extra money, you’ll find that a world of new possibilities opens up to you. The follow products aren’t all that expensive, but they provide a selection of improved hardware, greater versatility, and functionality that makes them far more impressive than their lower-budget rivals. 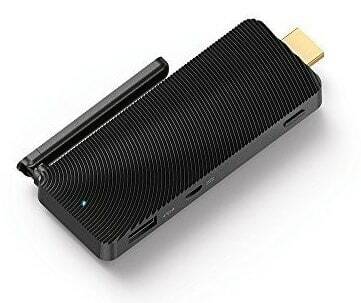 Let’s open this category with the Azulle Quantum Access – possibly one of the best known mini PC sticks. It currently retails for around $100 and features a prominent WiFi antenna to improve signal strength and let you connect to your network connection no matter where you are. As far as hardware goes, the Quantum Access is one of the best. It boasts a 7th generation Intel HD GPU, a 1.3GHz processor and 2GB of DDR3 RAM. This means that it’s best suited to general use applications – browsing the internet, word processing, and the like. So it’s perfect, right? Not quite. It only has a single USB port. There is an SD card slot, and ample onboard storage (32G), but this does limit connectivity somewhat. Luckily, there’s a Bluetooth receiver built-in so you can always connect your other hardware that way. So what are our final thoughts on this product? This stick is excellent, all things considered. It runs smoothly even though Windows 10 can be quite resource-intensive, plus the wireless antenna guarantees you a stable connection even as you get farther from the router. If you’re sick of putting up with poor wireless signal, this might be the one for you. 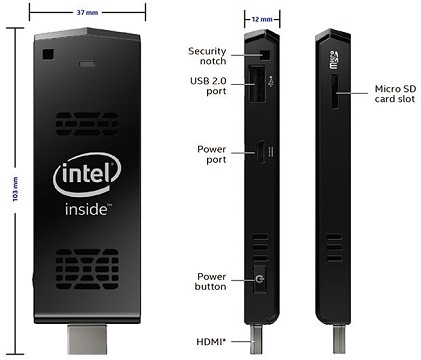 Next up, we have another Compute Stick from Intel, this time the CS125. There are a couple of major differences, though. The most apparent is the price – this model costs around $125, but there’s also an extra gigabyte of RAM and Windows 10 is installed instead of the more difficult to master Linux. This is a stick designed to work for a foreseeable amount of time. 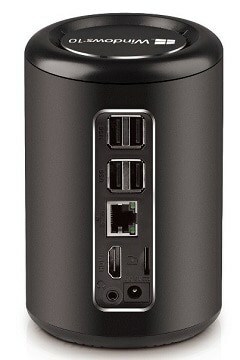 It has one USB 2.0 port, and one for USB 3.0 devices. Most recent peripherals use 3.0 since it allows for faster data transmission, so this is a small yet worthwhile addition. 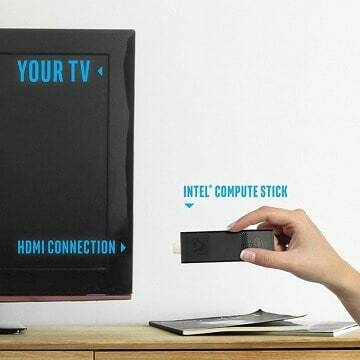 Hold on, though: there’s more to this stick than just its USB ports. 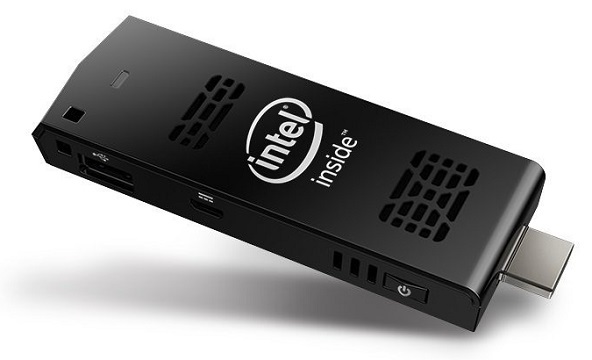 All the usual suspects are here; there’s the Intel HD GPU, Bluetooth receiver, and a quad-core processor. We were particularly impressed by what’s in the box, though: there are adaptors for three different countries’ outlets. If you’re the kind of person that travels a lot and works on the road, the CS125 is exactly what you need. As if that wasn’t enough, the CS125 comes with a full year’s warranty coverage. You should note that this won’t apply if you repartition the device, but most casual users won’t do too much tweaking anyway since it’s already pretty well optimized for its hardware. Okay, the following product isn’t technically a PC stick. The GordVE Z3735F is, however, an extremely portable computer system that works in the exact same way. Its slightly larger size enables it to offer far greater connectivity, too, as we’ll explain below. First of all, there are four USB ports instead of just one or two. There’s also both a WiFi antenna built-in and an Ethernet port for local connections. That’s not all! There’s also an SD card slot, headphones jack, and HDMI out. These features put it ahead of its rivals, but how does it run? Thankfully, there are minimal functional differences between this product and a computer stick. It comes with Windows 10 already installed, a 1.8GHz processor, and 2GB of RAM so really, you’re compromising on the size in exchange for an easier time connecting your devices and accessing the media you want. At 5x4x3”, this is an extremely small computer system. It’s the perfect size to throw into a backpack and doesn’t lack the speed or functionality that PC sticks have become so well-known for. If you like the idea of a PC stick but want something a little more practical, check out the GordVE Z3735F. Okay, now we’re onto the big guns. The following PC sticks are equipped to do more than just the occasional office work. Instead, they provide the power required to make them a regular part of your working kit. They are a little more expensive, but the increase in performance makes them worth every cent. Take the Azulle Access Plus, for instance. This stick costs around $160 and claims to be one of the only PC sticks that has an Ethernet port. 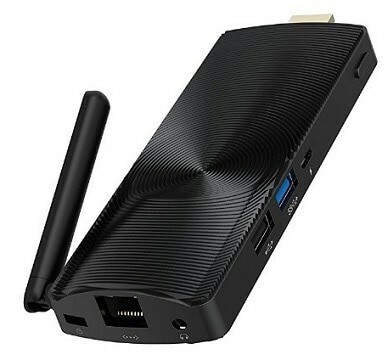 Unlike most of its rivals, it has a dual-band WiFi antenna and Bluetooth 2.4 tech that allows you to connect to the latest and greatest peripherals. Believe it or not, it gets better. Let’s address the hot issue here: how does it run? In short: like a dream. The Access Plus comes with double the amount of RAM that its less expensive competitors do, at 4GB. This guarantees that the Access Plus is less likely to freeze, hang, or stutter and ensures seamless multi-tab browsing. Even the system architecture is different. Most PC sticks ship with a 32-bit operating system, but this one comes with 64-bit Windows 10 already installed. With 4GB of RAM you should see considerable improvement over a 32-bit OS, however, the speed is limited a bit by the unfortunately average processor. Mini PC sticks have a lot of potential. If you were feeling underwhelmed by the specifications on the products we’ve covered previously, the Access Plus should change your mind. Plus, it costs less than the cheapest laptop so what do you have to lose? Moving on, we have the Intel CS325. 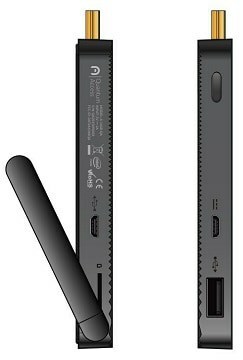 This is a PC stick that offers similar specifications to the Access Plus but costs significantly more, at around $330. There are some pretty clear differences between the two, though, and we think the CS325 is more than worth it for those with a lot of work to do. For a start, this stick has the most powerful processor out of any we’ve seen so far. The m3-6Y30 CPU has a clock speed of up to 2.2GHz, which is almost twice that of the products above. Now, specs are all well and good but what does this mean for the user? Essentially, you should see smoother performance even when under heavy load. The least expensive sticks struggle when you open multiple browser tabs but the CS325 can handle this, plus whatever applications you’re running at the same time. It also has a vastly newer version of Bluetooth so it’ll work with recently released headsets and accessories. Most people won’t need a product like this, but those that do will find the CS315 to be a smaller, more portable version of their work computer. It may have a higher price tag but isn’t it worth it if you can work from wherever you choose? Last but by no means least we have the Lenovo Ideacentre. This model costs around $250 and comes with a 32-bit version of Windows 10 preinstalled. So what helps this product stand out from the crowd? Well, it’s incredibly small, but that’s just the beginning. The Ideacentre comes with 32GB of internal storage. You can also use an SD card to bump this up to a total of 256GB if you’d like. With just 2GB of RAM, this isn’t going to be a powerhouse system, but it’s still more than capable of taking on all the day-to-day tasks you might expect. Really, this PC stick is perfect for students. It’s fast enough to get work done without becoming frustrating and has a large enough capacity to store every single assignment, task, and assessment you’ll be given until you graduate. Ideally, this model would have a little more RAM, but it still works out cheaper than a laptop so it’s hard to complain too much. 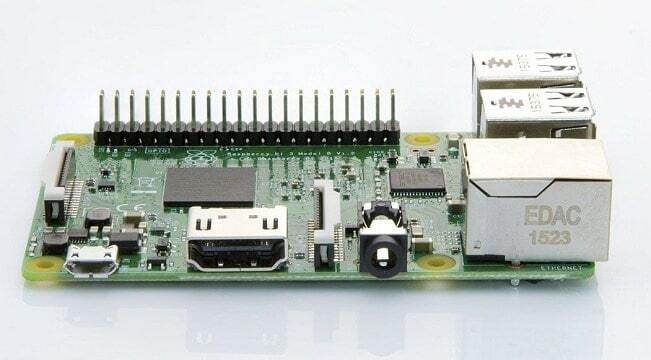 The Raspberry Pi 3 isn’t quite a stick but it is an exceptionally small computer system designed with tinkerers in mind. It doesn’t include any operating system and it has just a gigabyte of RAM, but the real beauty of this card is that it costs less than $40 and can be used for literally anything you want. Let’s just run through its hardware for a second. A 1.3GHz processor, headphones jack, HDMI port, four USB ports, an SD card slot, and built-in WiFi/Bluetooth capabilities. Once you’ve installed an operating system on this, there’s really nothing you can’t do. Want to turn it into a CCTV system? That’s okay! Just want to check your email? That’s fine too. There’s a common theme amongst the PC sticks above. They’re all very plain looking. The Raspberry Pi 3, however, can be contained in any case you’d like, and there are hundreds available. It even uses the same 5V power cable as the PC sticks do, so really, all that’s different is the slightly increased setup time. 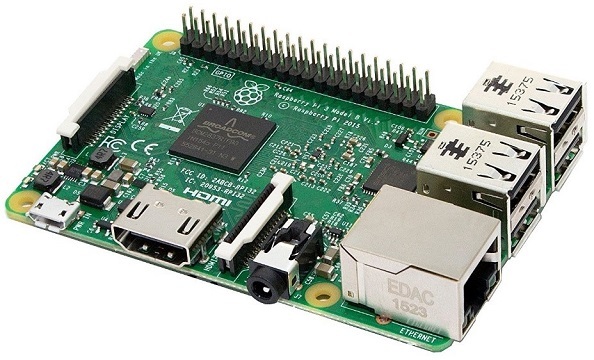 The Pi 3 is ideal for those of us that like to try new things. It can be set up in just a few minutes or can occupy you for a weekend. Really, this isn’t just a tiny, portable PC – it’s a product that will allow you to explore the limits of your programming knowledge and have something useful to show for it at the end. Really, if that isn’t worth around $30, we don’t know what is.